Honeybee on Passionflower, Ambler Road 2016. Photo taken w/ a Series 5 Samsung phone. 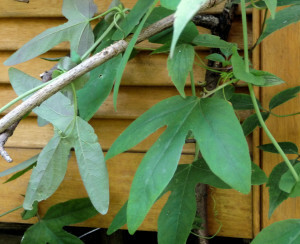 Climbers from the tropical and subtropical Passiflora family are tender, but some do survive outdoors in London. Passiflora Caerulea, the Blue Passionflower, with radial filaments tipped in deepest BLUE, is said to be hardiest in London’s cold wet winters. 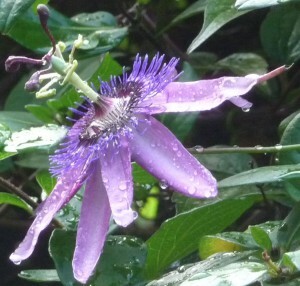 This Passionflower grows in several Highbury front gardens. 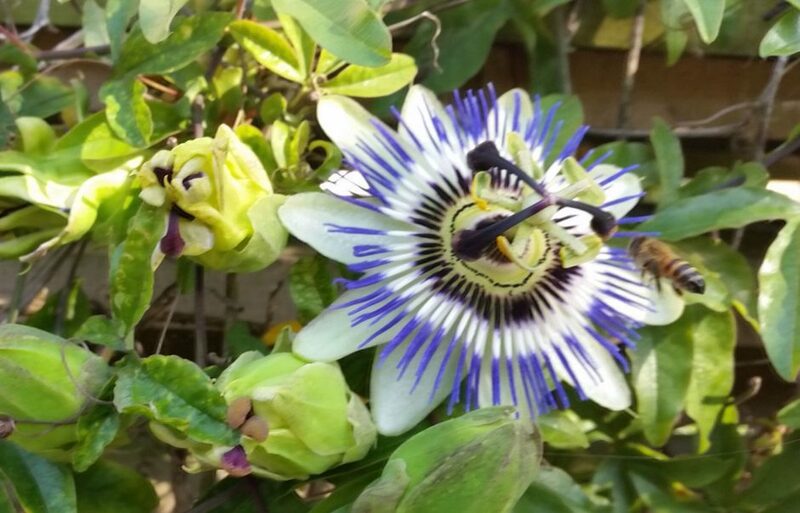 These photos are of an obviously happy Passiflora Caerulea, planted just inside the pavement on Ambler Road close to Blackstock Road, where its exuberant growth covers a wooden slatted screen for bins. 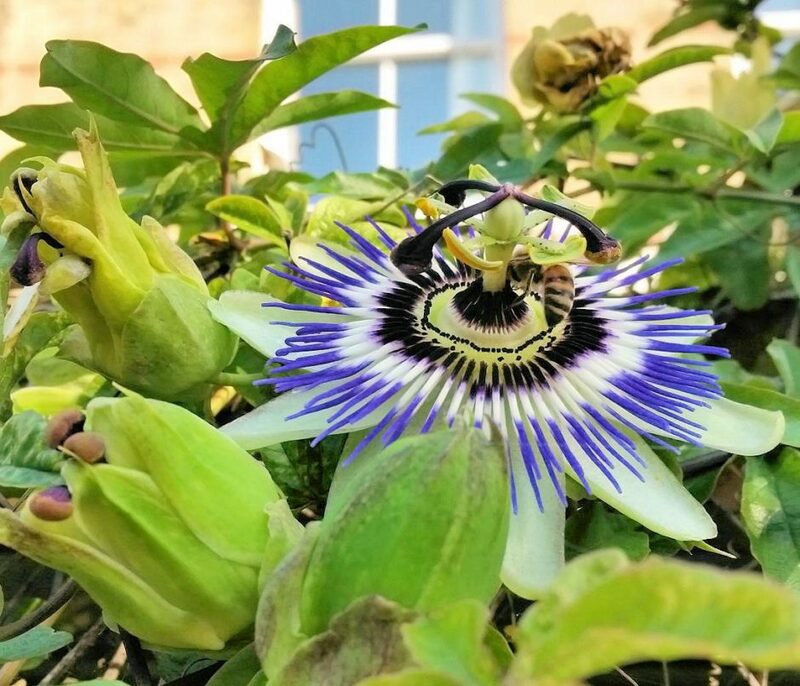 In tropical climates it may be hummingbirds or bats visiting the Passionflower; here in London, honeybees and bumblebees are the visitors. This honeybee may be from our local beehive on Plimsoll Road. 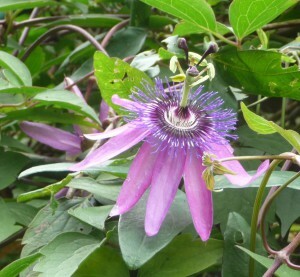 Conservation Ranger Louisa & volunteers managed to grow Passiflora on a site near the Regents Canal, on a pergola. 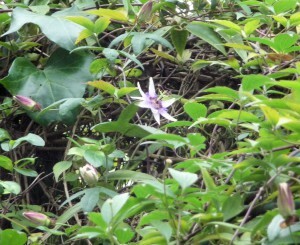 Louisa said that two Passionflower plants were lost to winter cold before a third managed to survive. Other names: Espina de Cristo (‘Thorn of Christ’), Spain); Dorn-Krone (‘Crown of Thorns’) & Muttergottes-Stern (‘Mother of God’s Star’) Germanic), Carkifelek (Rota Fortunae (‘The Wheel of Fortune’), Turkey), ‘Clock Plant’ (Greece, Japan), ‘Clock Flower’ (Israel), Liliko ‘t (Hawaii). 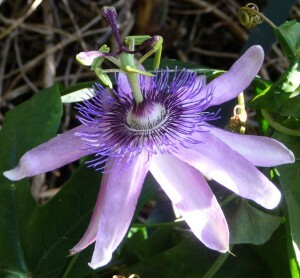 We have tried Passionflowers in our wildlife garden. Young plants succumbed to slugs, snails, and/or mice. One mature plant was from Capital Gardens at Alexander Palace. Already flowering in its pot, it bloomed prolifically on the Rose Arch with each flower drawing many pollinators to itself. Sadly, it did not survive the winter. 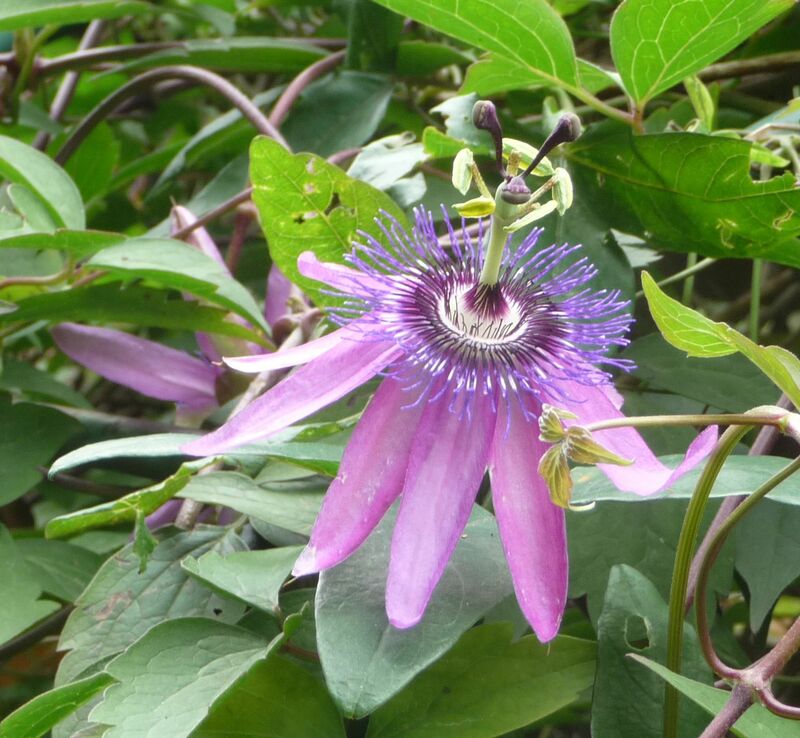 28 April 2015 – A new adult Passionflower, from the Hornsey Pet and Garden shop, has been installed today. We shall see how it fares. There was a great tangle of twining tendrils to sort out, many buds & two flowers that opened completely in the sunshine straightaway. 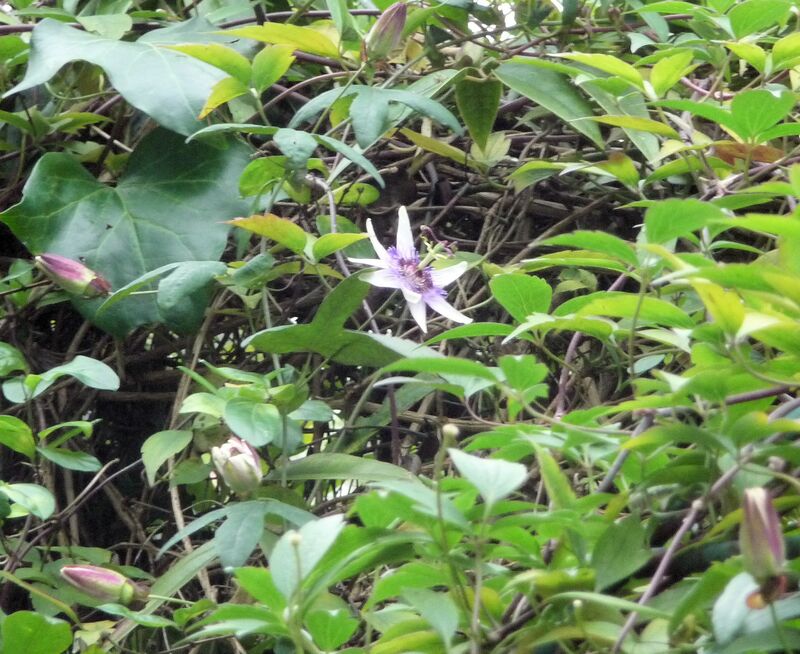 10 November 2015 – After a summer of growth, the Passionflower has made much of itself in the southeast corner. Our flower, with petals coloured a soft LILAC, is called ‘Amethyst’ and has long been grown in the UK, apparently. February 2016 : Our Passionflower was doomed by a short spell of cold, wintry weather. Sad. Below, a squirrel looks across at the yellowing leaves. A neighbour’s Passionflower survives, growing against brickwork by their front door. Perhaps the extra warmth from their home made the difference. 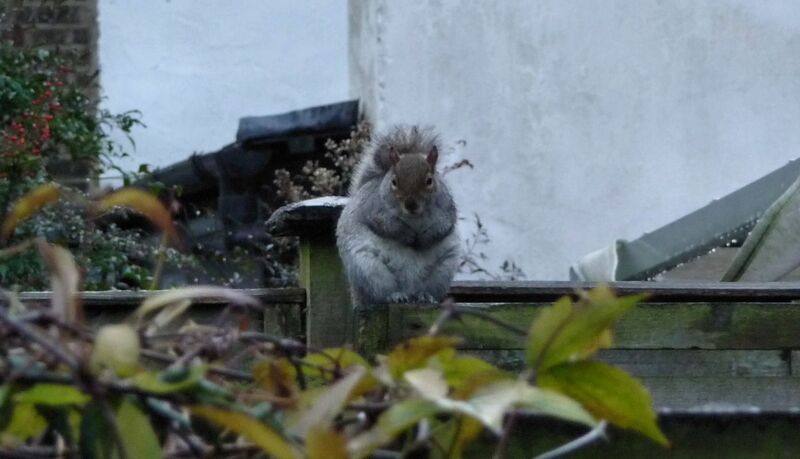 Our back garden does get a lot of strong wind.